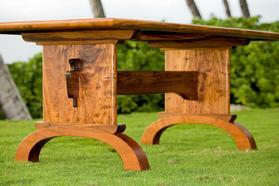 We can make a wide variety of custom woodworks. Architectural works including, staircases, handrail and balester systems, custom wooden entrance gates, carvings, entertainment centers, beds, doors, whole home mill packages and much more. Just ask! We have made a variety of different style tables and have enjoyed creating and working with clients on every one of them. Tables, more often than not are a very visible piece of furniture in the home. We feel that along with function, the proportions of a tables components to itself, as well as the room it lives in are the most important factors when it comes to designing a custom table. We hope you enjoy what you see. 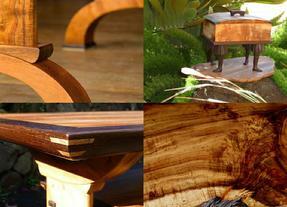 For centuries chairs have been an ever evolving labor of love of craftsmen. The age old battle of comfort vs.. beauty is still alive today. Though difficult it is possible to have a symbiotic relationship between the two. Through much trial and error we have arrived at geometry we believe accomplishes just that. The sensual curves of the human spine are some the most beautiful forms in nature rivaling aerial views of meandering streams and rivers. 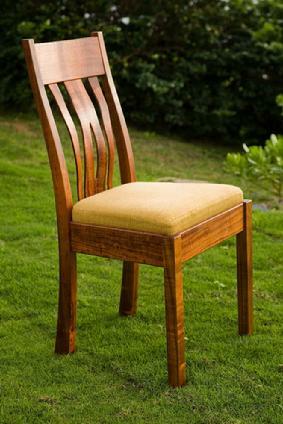 These curves are also the most crucial points to form fit when building chairs. By patterning the human body we are able to make a chair that feels good and looks pleasing to the eye. We hope you enjoy what you see in the pictures. 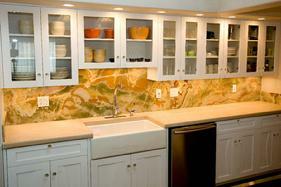 We can design and build any configuration of custom cabinets. We can also build cabinets to your plans. The sky is the limit! The ultimate in comfort. There is nothing like sitting on a well designed sofa or love-seat. We haven't actually seen any statistics but we think its a safe bet that more naps have been taken on upholstered sofas than any other furniture in the modern home. With that in mind we think it is important to make our upholstered furniture using the least toxic materials available. 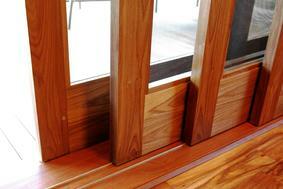 Sustainable American hard wood frames as well as organic wool, cotton, and hemp coverings whenever possible. Is your your mouse clicking finger tired? No worries just a couple more clicks and you can rest it while you watch our slide show. You will see a wide varity of pieces we have made. Just a few more clicks to get there. Start the slide show by clicking on the image to the right, then follow directions from there. Enjoy! 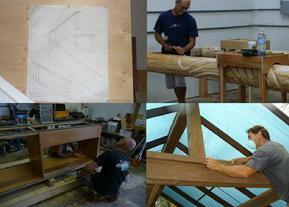 We thought some of you might be interested in see some photos of works in progress. Enjoy!